Modern computer vendors do not prioritize serial device connectivity. This is despite the fact that serial ports are still in use, and are more common in many industrial applications than are USB ports. We have a solution for those users who need to connect a serial device over LAN to a machine with no COM port, or for connecting to a serial device that is in a remote location. By employing software that enables sharing a serial port over Ethernet you can connect to COM devices that are located remotely. This same software lets you use COM ports on computers without a physical COM port by using serial port over LAN technology. Serial over Network Connector is an old-timer software product developed by Eltima Software and has been on the market for many years. This tool is a cross-platform application that supports Windows and Linux operating systems. Serial over Network Connector allows your computer emulating multiple serial ports, which is useful in the absence of any actual hardware serial ports. You can also work with devices located across the world by using its COM port over LAN feature. The number of virtual ports you can create is only limited by your system’s capabilities. Communication data is transmitted between your network and serial device by using a serial over LAN connection. 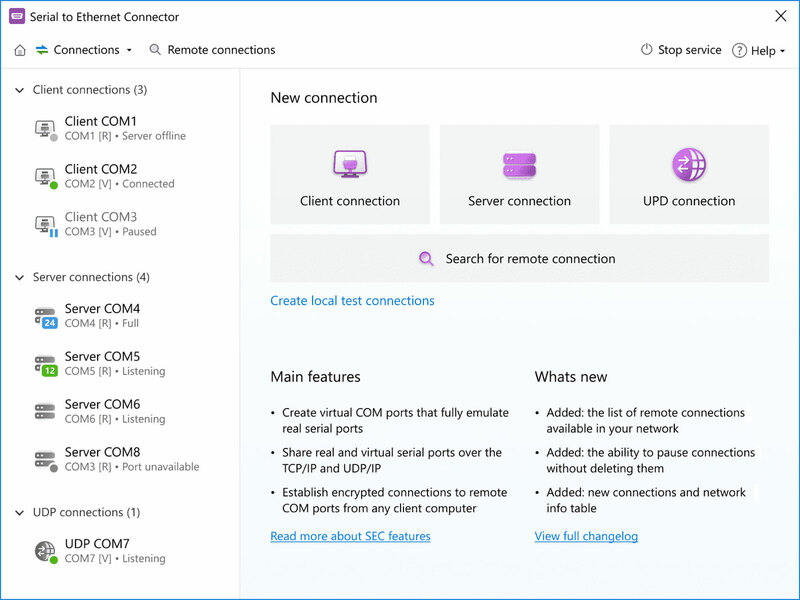 Users can redirect serial ports to virtual PC, Hyper-V, VMWare, etc. with this RS232 to LAN software converter. This software tool lets you create virtual COM port pairs that can be used by a program working with a serial device as well as programs running on other network connected computers. Virtual ports that you create and share act identically to physical ports and applications working with the ports treat them as if they were real ports. Serial over Network Connector supports Windows systems from XP (32-bit and 64-bit) to Windows 10 (32-bit and 64-bit) and Windows server 2012. There is also a Linux version available for ARM-based devices and computers, making Serial over Network Connector accessible for embedded devices. TCP/Com is a program offering a simple solution for issues surrounding device interfacing and RS232 to TCP/IP conversion. It can be used for a variety of tasks requiring a serial to LAN connectivity. Some of TCP/Com uses are to turn your computer into a Serial Device Server, using any app to send and receive data over a TCP/IP connection, and open serial ports on a remote machine and use them as if they locally connected. You can also map one TCP/IP port to another port as well as send data from a single physical network serial port to multiple RS323 serial applications. Windows systems from 98 to Win 10 (32- and 64-bit) are fully supported. Network Serial Port Kit is another RS232 to LAN software application that enables sharing of COM ports and serial devices locally or over the network. Using this tool enables physical COM ports to be available to other computers on the same network. This package makes it easy to connect to remote serial devices no matter where you are located. All virtual COM ports replicate the properties of the physical ports which present them to your system as if they were all physical ports. Network Serial Port Kit supports Windows OS 32- and 64-bit and allows you to share and access an unlimited number of serial devices. Serial-TCP/IP is another example of a program that enables serial over IP on Windows machines. This tool can extend the limited serial communication distance by going over TCP/IP as well as allowing remote access to your TCP/IP control software. Your COM and TCP/IP network traffic can be analyzed using the tool’s built-in options such as “Ping”, "Resolve IP Address / HostName", "COM Port State LEDs", and "Data Logging”. As with the other software solutions listed above, Serial-TCP/IP can be an indispensable tool for debugging serial software and hardware applications. Support of this product is limited to Windows 7, 8, Vista, and XP (32 and 64 bits). Advanced Virtual COM Port is a RS232 to Ethernet redirector software that includes the ability to create virtual serial ports. As with the other apps we have been discussing, the virtual ports created by this program act exactly like physical ports. This allows any programs interacting with the virtual ports to see them as real hardware ports. You can easily create and monitor up to 255 virtual ports. Ports can be created and removed without requiring a reboot of your system. If you require RS232 over LAN capability you should take a closer look at these software products. E.g. serial to LAN extender software is playing an important role in industrial automation systems and many other production control units. The above mentioned software can also make serial appliances available from any computer with the ability to create virtual interfaces emulating a hardware port. Some of them are free while some do come with a cost. Considering that a paid application will also include dedicated technical support and provide timely updates, you should look at all options and not necessarily always go with the least expensive solution.